Real estate rentals have always been a fast paced business for me. A rental can be closed from beginning to end all in one day whereas a home sale an take months of hard work, bank approval, appraisals, inspections, and more to complete before the closing. A lease agreement signing can be very quick, but a landlord should take the time to make sure the tenant is carefully screened first. As a landlord, one of the stressful aspects of renting is you need it rented FAST! Every day your rental property is vacant, it is losing money, so you must rent it as soon as possible at the best rental rate possible to the best qualified tenant possible. What's wrong with my property? Am I asking too much money? Is it me? Do I smell? Is it the rental market? The simple truth to all of those questions is... YES! (But I won't judge you on the smell. It may be a good smell) Take a look at this crude drawing I made of a triangle. 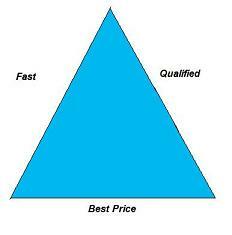 The 3 sides are labeled with "Fast", "Qualified", and "Best Price". It can be difficult to get all 3 sides of the triangle, but I'm telling you, you must! First, understand the important factors needed to procure a fast rental and also the reasons a rental does not rent quickly. It is usually a matter of how you look at things. Many landlords look at tenants as sub-human trash who don't deserve to live in as nice a home as the landlord lives in or should be willing to take what they can get since they are not in a position to be choosy. Well, while that may be true for a small percentage of the tenant pool, these days, most tenants are more choosy than ever and believe it or not, there are more quality rentals out there than ever before. Landlords have become competitive in attracting the better tenants by offering better rental units. Besides offering a quality rental you'd be happy to live in yourself, another thing to keep in mind is the rental price. Are you offering a good deal to the tenant? Many landlords arrive at their price simply by trying to cover the cost of their mortgage, taxes and insurance. Often those costs are too high to be a competitive rent. In that case, we have an unhappy landlord who will be forced to endure a negative cash flow or long vacancy periods while they have little success finding a tenant to pay the higher rent rate. The best pricing method for rentals is by doing a "Competitive Rental Market Analysis". This is done by comparing the other rentals on the market, taking into account the ones that have rented, how long it took for them to rent and what price they rented at. Most real estate offices with rental records can do a computerized report for you, but you can easily do your own research on local Craigslist ads, Newspapers, and some MLS rental records can be access by the public. Q: Is it a good idea to take a lower rent from a more qualified tenant who plans on a long term rental? A: Yes, I would and do. A more qualified tenant is the goal and the essence of a pleasant long tenancy. Q: Is it a good idea to take a higher rent from a less qualified tenant who plans on a long term rental? A: It depends on how less qualified. If the tenant is not qualified, it really doesn't matter how much higher he agrees to pay, because you probably won't get your rent money and will be spending your own money to evict these "generous" non-payers. Q: My price is great, but no one is responding to my ad. What's Wrong? A: It could be many things. Do you refresh your ad to keep it current? Online ads can get stale. They need to be resubmitted to stay current. Is your rental desirable? Is your ad attractive and inviting? Does it have good pictures? Do you list amenities? Is it in a good location? Does the property need work? Sometimes it may be the ad. How is the market demand for your rental? Is it really priced right? local landlord associations - when someone rents, they usually have a number of other good tenants who call after a lease was signed. Try to remember that it is important to get your rental rented quickly, but it is even more important to get it rented to a good qualified tenant. You know, if you've been in the landlord business long enough that "It is better to have NO tenant than a Bad tenant!"